Trichomonas vaginalis is a protozoon with a flagella. It commonly infests women's lower genital tract. At times, there are no clinical signs, however leukorrhea are generally present, and the mucosa shows focal punctuated bleeding giving a typical appearance referred to as a strawberry cervix. The living parasite can be observed in a wet or hanging drop preparation and is clearly identifiable under the microscope due to its typical motility. 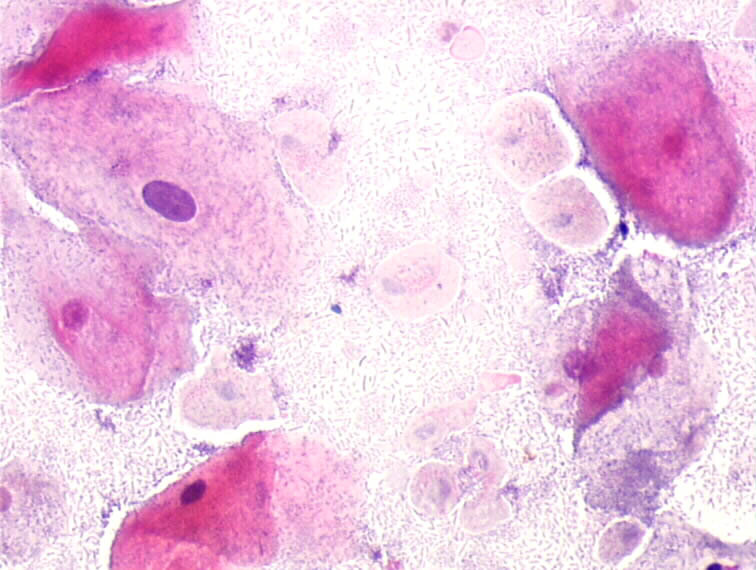 In the Papanicolaou stained smear the parasite are difficult to identify. They appear as a small pear shaped organism with typical nuclei. The flagellum is rarely noted. The smear picture shows large squamous cells, generally with eosinophilic cytoplasm and degenerating cytoplasmic borders. Small perinuclear halos are often noted (different from the large irregular clear zones noted in koilocyte). When such a smear pattern is present a careful search for Trichomonas is needed and a false LSIL diagnosis must be avoid.